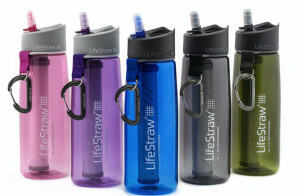 The LifeStraw Go incorporates 2-stage filtration technology into a refillable water bottle. The 2 Stage Filtration LifeStraw bottle consists of hollow fiber membranes to remove 99.9999% bacteria and 99.9% protozoa in addition to an activated carbon capsule to reduce chlorine, bad taste and organic chemical matter that may be present. Every eight seconds, somewhere in the world, a child dies of water-borne disease.